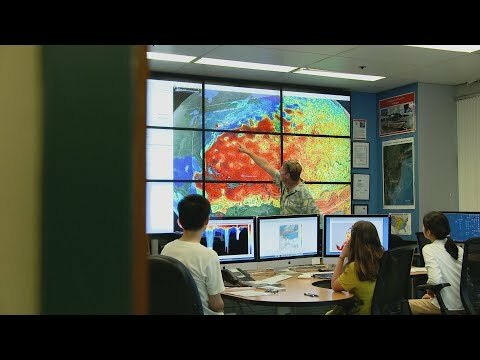 Share the post "Professor Mark Gregory Robson Wins Statewide Public Health Award"
Mark Robson, specialist in entomology, Department of Plant Biology and Pathology. Mark Gregory Robson, distinguished service professor and professor, Department of Plant Biology and Pathology, has been unanimously selected to receive the 2016 Frank J. Osborne Memorial Award by the New Jersey Association of County and City Health Officials (NJACCHO) at the Atlantic City Convention Center on November 16. This award is the highest honor bestowed upon a member of New Jersey’s public health community and is presented in recognition of meritorious achievement in public health. The criteria include the degree to which a candidate’s contributions address key public health issues; the measurable results achieved by the contribution; the collaborative efforts created by the contribution; and the extraordinary contributions to the NJACCHO. “Suffice to say the Awards Committee and Executive Committee agreed that you abundantly satisfied these criteria for your voluminous and continued contributions to the public health community (locally, regionally, nationally and internationally), our future public/environmental health professionals and New Jersey’s residents,” said Peter N. Tabbot, health officer, Rockaway Township Division of Health. The late Frank J. Osborne began his public health experience in New Jersey as Assistant Health Officer of Montclair, was a Health Officer of Orange, and finally Health Officer of East Orange, a post he held until he retired on December 31, 1961. Osborne was a member of the former State Board of Health from 1945 until 1947 and was appointed by the State Commissioner of Health to be chairman of a committee of municipal health officers. This committee drafted a list of Recognized Public Health Activities and a set of Minimum Standards by which to judge them. The State Department of Health subsequently adopted them as standards to which all good health departments should conform. The Frank J. Osborne Memorial Award was established by The New Jersey Health Officers Association in November of 1961 at Osborne’s retirement dinner. Robson has also amassed a long and distinguished record of service to the university and beyond, and his contributions and awards are numerous. 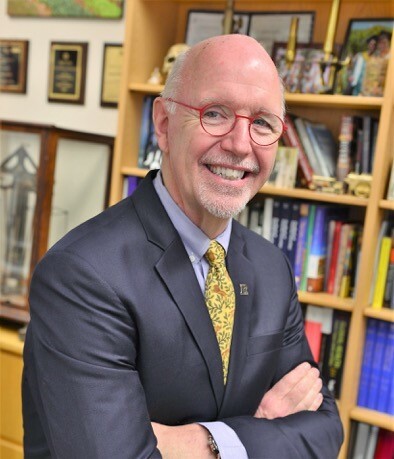 He was named a 2015 Loyal Son of Rutgers, is active with the Rutgers Centers for Global Advancement and International Affairs and has won many teaching awards, including the highly competitive Association of Schools of Public Health Pfizer Teaching Award. He has served as a member of the Board of Directors for the National Board of Public Health Examiners. He’s the recipient of the prestigious Mehlman Award from the International Society of Exposure Science. He’s also been active working with Isles, Inc. of Trenton, The New Jersey Farm Bureau, the New Jersey Department of Agriculture, and in particular, the New Jersey Department of Environmental Protection on a number of important health related issues. For two terms, from 2004 to 2010, he chaired the New Jersey Drinking Water Quality Institute. 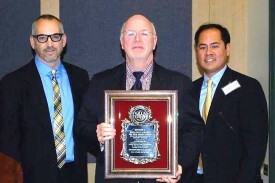 Robson receiving the Dennis Sullivan Award, with (left) nominator Mr. Peter Tabbot, health officer and (right) Dr. Oliver Lontok, NJPHA president. In October 2014 Robson received the Sullivan Award, the highest award from the New Jersey Public Health Association presented to an individual for dedicated and outstanding public service and contributing to the cause of public health in New Jersey. His international service has also been long and significant, resulting in his 2013 election as a Fellow of the Collegium Ramazzini, a prestigious honor recognizing his global contributions to occupational health. Other global recognition of Robson’s work includes an Honorary Doctorate in Public Health from Chulalongkorn University in 2010, making him one of only three U.S. citizens to receive this honor; the other two were both U.S. presidents.